Monrovia, September 5, 2018:Internal Affairs Minister Honorable Varney A. Sirleaf says effective monitoring of County and Social Development Funds sponsored projects is lacking at county level. This has led to implementation of low quality projects that his described as "White elephant" projects. The Minister was meanwhile assured that ongoing forward, the Ministry of Internal Affairs will emphasize on effective monitoring of all projects funded by County Development money. He called civil society partnership in this drive. 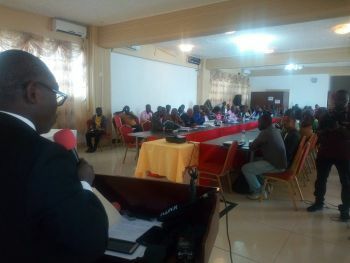 The Internal Affairs Minister was speaking Wednesday, September 5, 2018, in Monrovia at a high level dialogue on County Social Development Funds Reform organized by USAID's funded Liberia Accountability and Voice (LAVI).